Image courtesy of Kirstry M.
InterExchange Camp USA is, first and foremost, a cultural exchange program. Participants travel a very long way to make new friends, learn about American culture and improve their English. As you welcome InterExchange Camp USA participants into your camp family, we ask that you stay focused on the purpose of the program and help participants to achieve these goals. We thank you for providing young people with this opportunity and offer the following suggestions to help maximize the positive impact of cultural exchange at your camp. Let your staff know you’re excited about working with them! Send a welcome letter and camp brochure, plus any relevant forms. InterExchange highly recommends sending international staff your standard camp contract with start and end dates and any important camp rules. You may also want to include a packet from your local Chamber of Commerce. Pre-camp contact reduces your paper chase once the summer begins. Get contracts signed and returned and copies of certificates and medical reports on file before your staff is physically at camp. Assign one of your U.S. based year-round team members the responsibility of responding to all calls, emails and faxes from future international staff. Remember, your international participants are just as excited as you are and they want to be prepared. Make sure all contact information is on camp stationery and other pre-camp paperwork is updated. To cut down on telephone inquiries, provide your incoming international staff with names and phone numbers of past summer staff from the same home country. Be sure you have former participants’ consent before sharing their information. Use digital information, websites and social media to assist you. Keep web pages current. If you have a staff website, make sure you inform your international staff about it. As the summer draws closer, use your web page and regular email communications to share critical travel and logistical information to arriving participants. First impressions are long lasting! Encourage returning staff to meet and greet new arrivals. An immediate support structure promotes smooth transitions and begins the orientation process in an effective manner. Ask your camp leadership (unit heads, program directors, etc.) to set an example by reaching out to international staff. Create effective orientation strategies. Use experiential exercises and role-playing examples, provide handouts and conduct meetings, rotate group composition and group sizes to encourage maximum exposure. Provide staff with enough time to process information between each orientation activity. Downtime also allows for greater participation, discussions and social interaction. 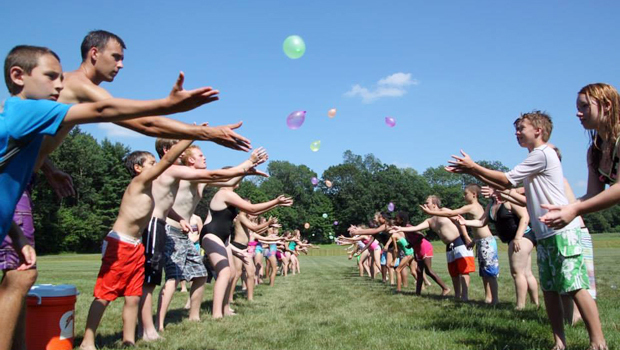 Use traditional camp activities to educate staff further and to break up the potential monotony of orientation. While you will need to set aside time to train both counselors and support staff in their specific duties, you should try to conduct as much of the orientation with the entire staff as possible. Whenever you break down into smaller groups, double check that every group includes both American and international staff. Also, try to house counselors and support staff together, even if just for orientation. Although all InterExchange participants are screened for their ability to understand and speak English, participants are often self-conscious and afraid of speaking imperfect English. Don’t assume that a participant who is reluctant to speak English is someone with limited language skills. In fact, he or she is completely capable of understanding and communicating. Support your staff by being patient and providing a comfortable environment for participants to improve their English. Let them know it is all right to make mistakes and that you’re there to guide them! You are responsible for providing international staff with appropriate housing, three nutritious meals a day and a stipend for the duration of their contract dates. If your camp shuts down for weekends or for a few days between sessions, please make sure that participants are not left without food or shelter during this time. Keep in mind that this time off, regardless of length, counts as part of the 63-day work period. Everyone appreciates having someone to listen to them. Set aside a specific time for staff to offer feedback about camp on (at least) a weekly basis. Let them know you’re there to guide them! Whenever possible, incorporate staff suggestions into camp life. Staff meetings are also an excellent time for you to address ongoing issues with your staff. Like orientation, staff meetings should involve both counselors and support staff. Take a few minutes to sit down with each staff member after a reasonable adjustment period. Encourage each person to do a verbal self-evaluation, then add your own praise and constructive criticism, if any. If you are not happy with a staff member’s performance, say so! Honest, diplomatic conversations prevent future conflicts and misunderstandings. Be sure to end the meeting by offering positive reinforcement and concrete suggestions for improvement, whether related to job performance, engagement in American culture or general interactions. A space that is designated as “camp staff only” is a nice way for staff to meet peers, relax and take time to reenergize. Provide participants with access to computers where they can email or Skype with friends and family back home. International staff generally do not have access to vehicles while at camp. Before the summer begins, have someone research the most time- and cost-effective ways to provide staff transportation. Run a camp van into town or to the nearest bus station twice a day. Speak to a rental car company about discounted rates for the summer. Invite staff who are off-duty to join campers going on out-of-camp trips. If you provide use of bicycles, please confirm the safety of the roads and discuss bike safety with your participants. Helmets and lights must be provided if participants will use bicycles as a method of transportation. Time away from camp relaxes and reenergizes your staff! If there is no laundry facility on camp property, please provide your staff with information on and transportation to the nearest laundromat. All staff members should receive their stipends prior to leaving camp grounds. Their guaranteed minimum stipend is found in the webapp when you login. Please consider paying your international staff with traveler’s checks as they may have trouble cashing a normal paycheck. Also, many of them will travel after camp and it isn’t safe for them to carry large amounts of cash with them. Think about the difficulties you personally might face if you were to live and work in a foreign country. How can you help your staff overcome these challenges? Continue to the next chapter, Cultural Exchange, or return to the Table of Contents.